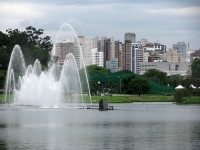 The Parque do Ibirapuera is a large park near the centre of Sao Paulo with many interesting features, including a planetarium, a Japanese pavilion, a gymnasium, the Obelisk of Sao Paulo (a symbol of the Constitutionalist Revolution of 1932), and the Cicillo Matarazzo Pavilion, which houses the Museum of Contemporary Art and is typically the venue for large events like the São Paulo Art Biennial and São Paulo Fashion Week. The park is home to many other museums, including the Air Force Museum and Folklore Museum. It also has jogging and walking trails and a picturesque lake. Generally the park is a good spot to explore for those wanting a bit of holiday exercise or some fresh air in the heart of this sprawling city.